For accurate magnification, maximum luminosity, great contrast, uniform resolution to the edge of the screen, freedom from distortion of the images. It is supplied with standard lenses with magnification 25x and 50x for contour projection. The maximum visible part of the object on the screen are 112mm and 5.6mm respectively. The screen size is 330mmx380mm (13"x15"). The maximum diameter and length of work accommodated on the stage are 40mm x 150mm respectively. It is having wooden storing cabinet with lock and key for safe custody of lenses etc. 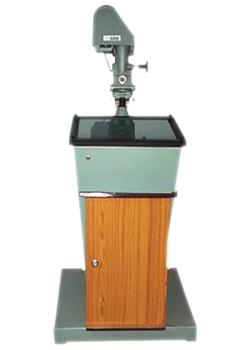 The height and weight of the instrument is approximately 1448mm (4'-9") and 68 kg respectively optional available magnification 10x.